Iran Is Preparing A Launch. But Is It For A Space Rocket Or A Missile? Iran says its intentions are peaceful, but the U.S. worries the planned launches are really about developing weapons — specifically, intercontinental ballistic missiles. "We're seeing all kinds of activity," says Jeffrey Lewis, a scholar at the Middlebury Institute of International Studies at Monterey, who is analyzing the images as they come in. In recent days, he has noticed cars and trucks moving around the site. "We saw a large number of fuel trucks show up, suggesting that there is fuel being moved to the site," Lewis says. "We can also just see all kinds of activity at both launch pads." Iran has said publicly that its motives are peaceful. It soon intends to launch several satellites for communications and remote-sensing as part of the nation's long-running space program. But in a statement, Secretary of State Mike Pompeo recently called the planned launches "provocative." He said these launches, if they happen, are really about developing intercontinental ballistic missiles (ICBMs). The technology used by Iran, he said, is "virtually identical" to what's needed for an ICBM. Markus Schiller, the founder of ST Analytics, an independent consultancy in Germany, has spent a lot of time looking at Iran's space program. He says the program does have links to the military. For example, the engines Iran uses on its Simorgh space launcher have a military origin. "It is actually a missile engine," he says. But not a very good one, he says. It's an old design from the Soviet Union, picked up by the North Koreans and later transferred to Iran. It's clunky and inefficient, and it uses a low-power kind of rocket fuel. That means a lot of fuel is required to get even a small payload into space, or a warhead to a distant target. The rocket has to be huge. It takes weeks to set up, and it can probably only launch when the weather is favorable. 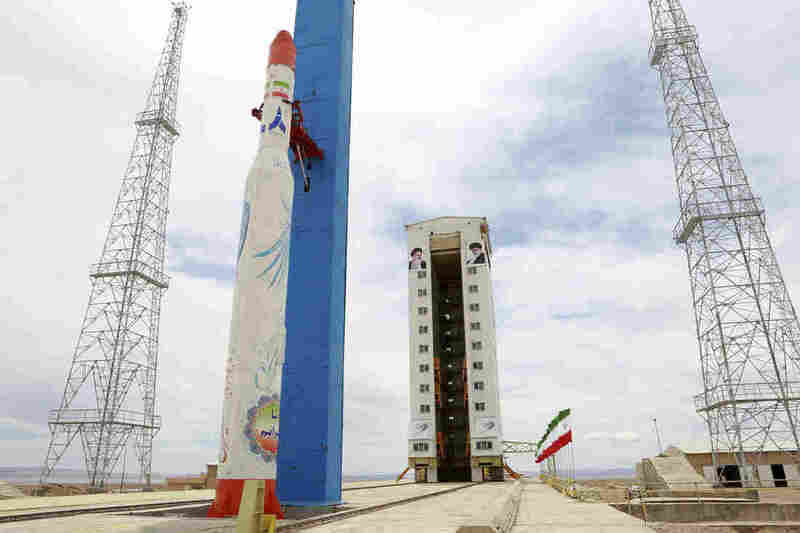 Also, Schiller says based on press photos like those released before a launch of the Simorgh in 2017, Iran's space rocket can't work as a missile. Its second stage is too small. Put it all together and he takes Iran at its word. Iran's Simorgh rocket pictured before an attempted satellite launch in 2017. Experts say the rocket's second stage is too small to be used as a missile. "Iran always claims that they don't want to build an ICBM but they want to pursue a space program," he says. "That's what I'm seeing right now." Even then, could a peaceful space program be a step toward developing a long-range missile? "If you look at the history of missile development worldwide, space launch activity has never been decisive," says Michael Elleman, a physicist and senior fellow for missile defense at the International Institute for Strategic Studies. In fact, he says, in every case he can think of, it has gone the other way around: Nations don't turn their rockets into missiles, they turn their old missiles into rockets. "We've lived through this debate once before," Lewis notes. In 2012, when North Korea launched a satellite into orbit, the U.S. called it "ballistic missile technology" and the U.N. Security Council tightened sanctions. But that "didn't stop North Korea from conducting space launches," Lewis says. "And more importantly, when North Korea did build an ICBM, they built a different ICBM." The missiles North Korea tested in 2017 used different engines and fuels than the rocket it had earlier used to launch its satellites. Elleman worries that the Trump administration's focus on Iran's upcoming space launches could be counterproductive. Instead, he says, the U.S. should focus its diplomatic energy on much shorter-range Iranian missiles. Those missiles are already being used by proxy groups like Iranian-backed rebels in Yemen to threaten U.S. allies. "I think we're spending a lot of political capital complaining about something that is not a direct threat or risk to the United States or the international community," he says.